South Euclid, OH, February 2017 – To enhance your child’s reading experience, EduWear™ (www.eduwearonline.com) and the 1000 Books Foundation (www.1000BooksBeforeKindergarten.org) have teamed up to celebrate your child’s reading milestones. 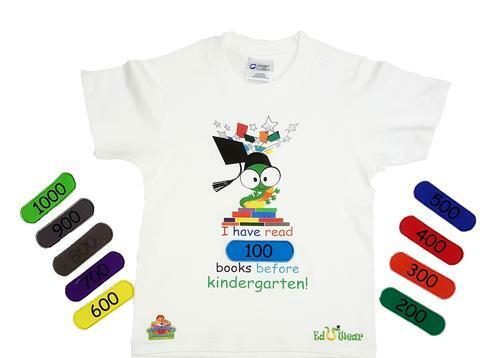 Eduwear has created the official “I have read 1000 Books Before Kindergarten” T-shirt with removable patches to help commemorate your child’s 1000 books reading milestones (100, 200, 300, 400, 500, 600, 700, 800, 900, and 1000). “We are very excited to be partnering with the 1000 Books Foundation to help spread the message of the importance of early childhood literacy.” said Nikki Mace of EduWear. “Partnering with EduWear was a natural fit (excuse the pun). Both EduWear and the 1000 Books Foundation realize that a child’s brain develops the most rapidly from birth to age 5. EduWear’s interactive clothing line is a fun and exciting way for a parent/caregiver to tap into his or her child’s genius,” said Diane Lee of 1000 Books Foundation. EduWear introduces language in unique ways, by providing fun and innovative educational products. The 1000 Books Foundation is a 501(c)(3), Nevada public charity, which was founded in 2013 to promote reading to newborns, infants, and toddlers and seeks to encourage parent-child bonding through reading. The 1000 Books Foundation helps to facilitate the implementation of 1000 Books Before Kindergarten (www.1000BooksBeforeKindergarten.org) reading programs nationwide and in Canada. For more information or to purchase materials for the 1000 Books Before Kindergarten program, please visit www.eduwearonline.com and www.1000BooksBeforeKindergarten.org.